Update (11/24): 100k Platinum offer is dead! Congrats to those that got it. 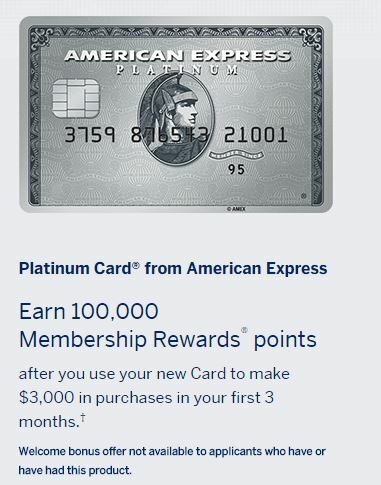 One of the big offers that I know a lot of my readers (looking at you Justin) are interested in is back and it is the 100,000 point signup bonus on the American Express card. I don’t know if this offer will last long so if you’ve never had a personal Platinum card before, I’d strongly consider jumping on this offer soon just in case. Here is the direct link to the landing page of this offer. You might have to use incoginto/private browseing mode to get this offer to appear. I’ve discussed this card & offer before but the 100,000 points (worth ~$1,500), $200 airline credit (yes gift cards work for some airlines), lounge access, Global Entry credit, hotel elite status at Starwood, Marriot and Hilton more than offset the $450 annual fee for the first year. One IMPORTANT Note: DO NOT put any manufactured spend on this card or you risk Amex freezing your account which they have been known to do. Also do not close the card right after you get the points – keep it open until the 10th/11th month or so if you don’t plan to keep it longterm. 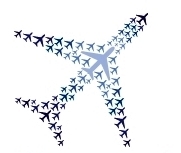 On top of this offer, there are increased offers on many other Amex cards. Here are some of the offers though I’d recommend reading this Reddit thread on all of the increased offers. Thanks Amex for the early Thanksgiving gift!